A Pathfinder Society Scenario designed for levels 12–15. 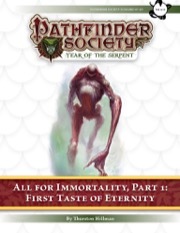 “First Taste of Eternity” debuts the first dedicated seeker-level content for the Pathfinder Society Roleplaying Guild since the acclaimed Eyes of the Ten series, and it is the first scenario in the three-part All for Immortality campaign arc. 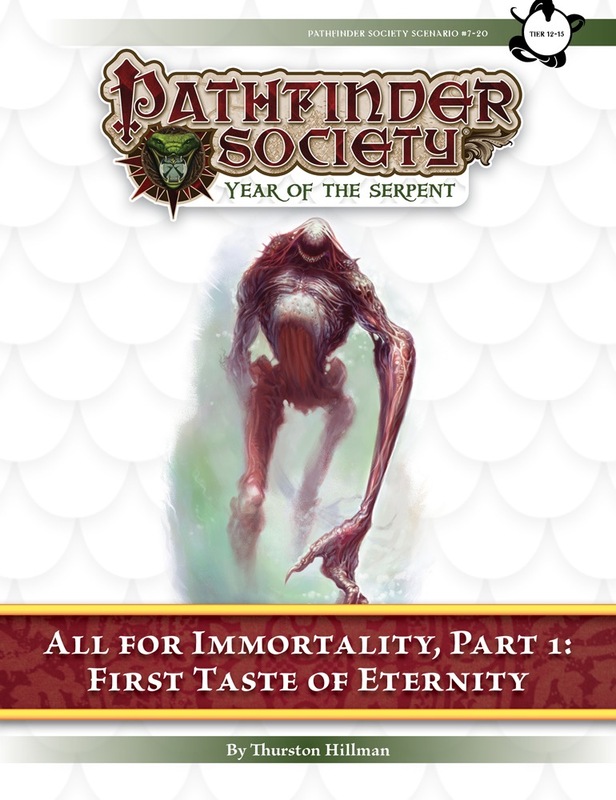 It is followed by Pathfinder Society Scenario #7–26: “All the Gods Beyond” and Pathfinder Society Scenario #7–29: “Serpents Fall.” All three chapters are intended to be played in order. Eternity is a combat scenario with some roleplaying and investigation mixed in. The story in Eternity was befitting for high level play. I enjoyed learning about the different groups protecting the sun orchid elixirs and our tactics to protect multiple targets at the same time. The combat challenges in Eternity were interesting and extremely well designed (the NPCs were built to challenge the PCs, not to roll over and die). The combat was tough but fair. But let’s face it, my PC almost died 4 times in this scenario alone when 150-200 points of damage is the penalty for failing a save, I was just lucky. Some of the combats lasted 7-10 rounds and were extremely satisfying, but that says as much about the GM as it does the scenario, but at least the GM has the ability to challenge any group if he knows what he’s doing. I don’t want to spoil it, but being a seeker, a boss, was very rewarding and I really enjoyed having the tables reversed. This aspect of all three scenarios was very rewarding and fun. Experience: Player at subtier 12-13 with 4 highly optimized PCs. Overall: A great start to high level play in the future. Thanks Tonya and John for having something to look forward to at level 12+. (10/10). This is the first part of what I've been looking for in high-tier (seeker level) scenarios. Everything about the feel screamed it had a major impact on both the society itself (particularly for the poor mooks under us) and for the society's relationships with its allies. The leadership mechanics where new, and stressed the feeling of, "I have no idea how to do this", which I believe was the point... organizing your own missions for pathfinder teams based on too little information and using what resources are available. Being thrust into leadership with (at least for myself) no practical experience was something that added a whole new level for me. The scenario itself, from acting as an elite strike team to an investigative force, the scenario flowed well and was exciting to follow. I found the final scenario to be well built, and had our party trying to figure out how to deal with it while keeping from triggering the traps and dying to the weakest of the three scenario bosses. Many of the fights were new and exciting, mechanics and threats I had never encountered before, as well as competently built opponents. Toss in challenging environments and it had us spinning our wheels trying to devise ways to tackle each problem while still managing the others. It was exciting and new, everything a seeker level scenario should be. I enjoyed the story, the set-up, ambiance, environments, and NPCs. The motivations of some NPCs could have been better elucidated, but oh well. I enjoyed that certain NPCs have counter-measures to abilities of specific characters in the party, and the manner in which this was explained in terms of story. The first two combats were thematic, engaging, and challenging without breaking the CR curve. I liked the Leadership mechanic, and am also glad the author made it a brief element of the scenario, rather than taking a majority of table time. That has been a problem in some other scenarios by this author, and I was happy that a more nuanced and balanced approach was used this go-round. The encounters were also well thought through in terms of having interesting enemies, intelligent and dastardly tactics, and a feeling that the purpose of the fight wasn't merely to 'beat the other guy', but to accomplish some greater goal. They were pretty challenging as well, at least in Hard Mode. The final encounter...well, it might have gone a bit far in terms of challenge. Opponents that are custom-made for specific scenarios really need to be more closely reviewed by the PFS development team before publication. This beast is stated at a high CR, but indeed its stats correspond a full 5 CR higher than that on the Average Monster Statistics by CR table in the Monster Creation page of the PRD. Well, other than HP. It's AC and saves in particular are preposterously high. Beyond its statistics, it also has several very significant advantages from its environment, which should raise the encounters CR by 1 or 2. It's pretty much a CR 25 encounter in the high-tier, unadjusted. Even for 6 level 15 characters, that's an APL+7 encounter. For reference, APL+4 is considered a coin-flip for party survival. GMs will have to be downright creative in how they softball that fight unless you just really want to TPK your lodge's seekers. It's a problem, so I'm taking away 1 star. The rest of the scenario was really quite impressive though. Very good work overall. Had the pleasure of running this for my fifth-star adjudication for two Venture Captains, two Venture Lieutenants, and another experienced GM (there were 21 stars on the opposite side of the screen) in an open slot. After a pretty thorough introduction for the players, this scenario hits the ground running full-tilt. Combats are tough but memorable -- probably the most interesting fights in the entire trilogy. I've since run this twice and played it once, and in all cases the final fight is a puzzler with a satisfying conclusion. Highly recommend this as a supplement or alternative to Eyes of the Ten for eligible characters. I got to play the series in high tier with 4 player adjustment (hard mode for some). I thought the story seemed disjointed between the scenarios. Part 1 is a story about the Sun Orchid Elixir and Pashow while the others deal with the Aspis. It didn't feel like it transitioned well. I thought the first 2 encounters could use some work mechanically but the final one was very cool. Unfortunately we played as part of convention and finished the entire series in 14hrs. I think a bit more time would have made everything feel less rushed and given time to explore more role play and combat too. I think the ideal is giving each part probably 5-6 hours. I like it! More "Immortality" adventures! It's in the blog post, andreww. Planning my running schedule now for this series!! This...sounds...awesome!! Oh wait...Thursty is writing the first one...this will be awesome!! Man, they fooled all the VOs then! Hopefully they keep Eyes of the Ten still available as well. I'm itching to play both. Seriously the only downside is that I can't play it NOW! Will each of the Immortality chronicles be worth 1 XP? Each will be worth 1 XP. I need this to kill-, er, challenge some characters. Whatever it is, I will not fail in my duties. As I understand it it has an entry slot for those who've played Eyes of Ten. Admittedly though the story background is getting a bit incongrous with what' happened to the Society since then. what are the level ranges for the series? If you are asking for subtiers, they are 12-13 and 14-15. What is the approximate run time for this one? Is this a 4 hour scenario or would it take longer? Considering the complexity of the combats and the role playing possibilities (and my own propensity for running long), I'm scheduling for 6 hours. I'm sure a fully optimized party and a GM who didn't want to role play would be able to accomplish it in less than 5, and even hit the 4 hour mark. Locally, I believe we've scheduled 6-8 hours to get through it. If we end early, we'll consider it a bonus. It's gonna be a hell of a thing. Kudos to the PFS leadership and the writers for this! We got it done in under 5 1/2 hours, since we all knew each other and we were in no rush, there was a lot of out of game chats, food, and drinking involved. In a pinch a veteran group could pull it off in four hours. Our group took about 8 hours over 2 sessions, not including the between session conspiracy crafting. Also, we wrote out PFS style mission briefings for the relevant section, which was highly entertaining but could also just be bullet points on a scrap of paper. You can milk it for a broader experience or you can get 'er done. Also, being high level play, the combats can swing in wide directions as far as how they unfold, deadliness, and time spent in tactical combat. I have only GM'd eyes, not played it so I can't compare it. I have played Academy of Secrets, and this was so much better than academy. I'm glad to hear you enjoyed the adventure, Mulgar. Thurston did a great job with this adventure, and I trust you'll have a blast with the rest of the series. When you get a chance, it would be great for you to leave a review. Developing high-level adventures is still fairly new ground for me, yet it's clear high-level content is something we should continue exploring. Your constructive criticism helps us make adventures even better (though we're quite happy with praise, too)! Finished the series today, so my review will be up probably tomorrow. So 2 1's rolled by PCs meant two of them 'Destructed' in the first encounter. Also feebleminded another. Party only save by the two handed fighter scoring a crit......Recovering from destruction really messes up your PC! !